- Your Average Abalone and Brian’s World will stay in place on Monday nights 7-9 pm. - The Bluegrass Situation Radio Hour with host Chris Jacobs is added Monday nights at 9 pm. - Mountain Stage moves from Saturdays to Monday nights at 10 pm. - Lady Spins the Blues with host Mary Carroll moves up to 7-9 pm. - Friends of the Blues takes the 9-11 pm spot for the month of May. - Blues America takes the 11 pm spot for the month of May. - New Release Hour Repeat with Doug & Brian stays at 7 pm. - Rhythm & Roots with host Mark Nicholas moves from 1st & 3rd Fridays to 1st & 3rd Wednesdays 8-10 pm. - Beyond and Back with host Hillary Culhane also moves from 2nd & 4th Fridays to 2nd & 4th Wednesdays 8-10 pm. - eTown with hosts Nick & Helen Forster keep their Wednesday 10 pm spot. - Beale Street Caravan moves from Tuesdays to Wednesdays at 11 pm. - Michelle Stewart and Connections moves to Thursday nights 7-9 pm. - North Bay Songwriters with host Jon Gonzales stays on the 1st & 3rd Thursday nights 9-11 pm. - Ric On the Radio keeps his spot on the 2nd & 4th Thursday nights 9-11 pm. - Art Of The Song with John Dillon & Viv Nesbit keep their Thursday night 11 pm show time. - This American Life stays at 7 pm on Fridays. 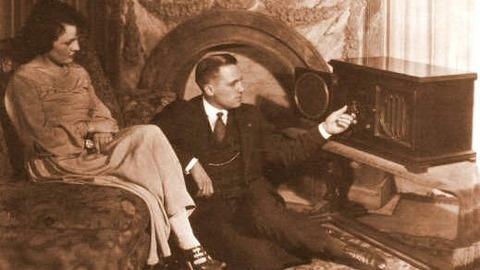 - Something Completely Different with host Roland Jacopetti moves to Friday nights 8-10 pm. - The Retro Cocktail Hour is coming to 1st & 3rd Fridays 10 pm – midnight. - Flashback! with host Bruce Robinson keeps his 2nd & 4th Fridays 10 pm – midnight. - Folk Alley and Elena See move to Saturday afternoons at noon to 2pm. - Jazz from the Left with Raoul Van Hall joins the Saturday night Jazz line up on the 4th Saturday of each month at 7 pm. - Alternative Radio from David Barsamian will take the 10 am slot on Sunday mornings. - A Novel Idea with host Suzanne Lang keeps her 1st Sunday of the month at 4 pm; Word by Word and Gil Mansergh keeps his 2nd Sunday of the month at 4 pm. - Political Breakdown from KQED at 4 pm and Bioneers at 4:30 pm will take the 3rd & 4th Sundays. - Space/Time with host Paul E. moves from Friday nights to the 1st & 3rd Sunday nights at 10 pm; Eclectica with Mr. Bad Rules will take the 2nd & 4th Sundays at 10 pm. 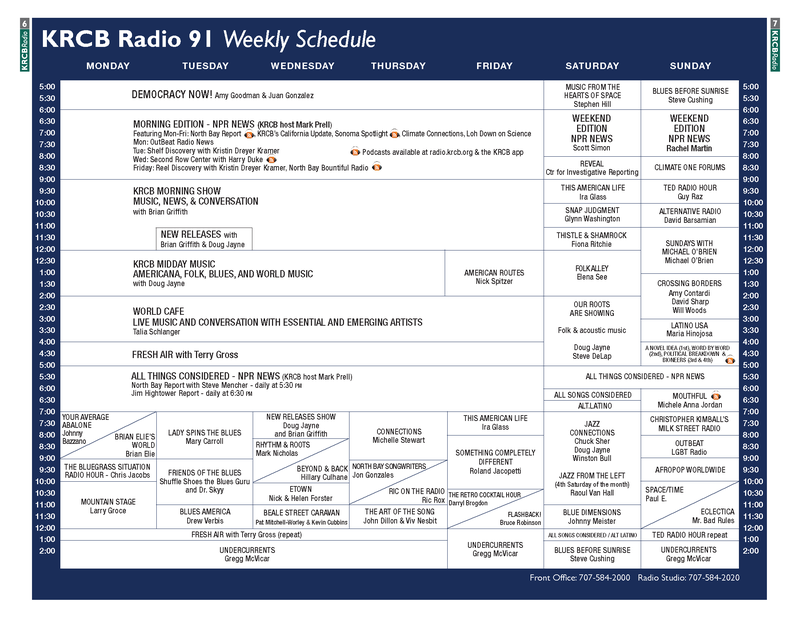 The printed version of the May 2018 KRCB-FM Radio 91 schedule is below; you can also find it in the May edition of Open Air in your mailbox or online at any time here.